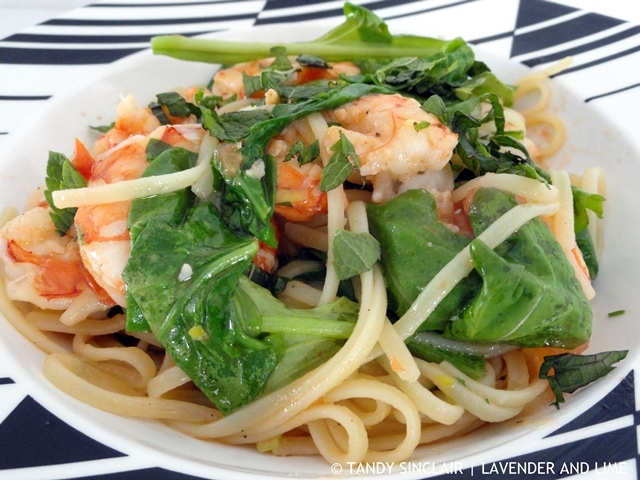 This prawn linguine is packed full of flavour from the herbs and garlic. Buy peeled, cleaned and deveined prawns if you do not feel like the hassle of doing that yourself. I am not a fan of the word diet, or following a restrictive eating plan. Dave and I subscribe to the notion that everything in moderation is good for you. We eat well, basing our lifestyle on one you would find in the Mediterranean countries. Our meals include whole foods that are locally farmed and in season. We have a drink every night and enjoy a glass of wine with our meals. I use the best produce I can afford and make sure to use extra virgin, cold pressed olive oil and real butter. We have tried to cut out starch carbohydrates at night. This is not always possible as some evenings I am experimenting for the blog. We usually only have one lunch meal per week when I can try out savoury recipes. When that happens I want to make something special. Last Saturday I made just such a meal. This concept for this prawn linguine is not my own. It is a dish that Dave and I enjoyed at Mauro’s in St. Francis. Dave and I worked on getting this recipe just right so that I could share it with you. It is a pushy recipe, one you really need to make. Dave would have preferred chilli in his and if you too can handle the heat, then go ahead and add some. We have a great chilli olive oil that Dave uses to drizzle onto his meals. I have zero tolerance for the heat and so use it sparingly when I am cooking. Can you handle the heat of chillies? How delicious! Simple, fresh and tasty-just how I like my pasta dishes. I’ll be adding chilli (not a crazy amount) just a little kick would be good. this sounds so good!! anything with shrimp, and i’m there. i love the flavor of spice, but can’t deal with the heat. i was eating dukbokki (korean spicy rice cakes) last weekend, and had to rinse them off with water because it was too painful otherwise. I don’t like food when it is that hot! Looks absolutely delicious, Tandy. I am flying in and out of CPT on Friday. Sadly Terence won’t visit due to the water shortage. This sounds like a perfect meal and one I hope to duplicate soon. I’ve pinned it. 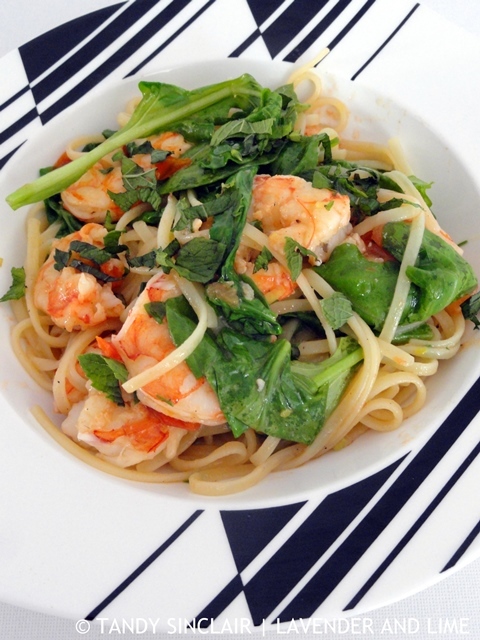 Oh yummy, might have to exchange my usual shrimp scampi and give this a try! Thank you, it looks beautiful. To answer your question…no to the chillies. Anything hot gives me miserable heartburn. But this dish does look delicious Tandy! This does look good! I’d definitely go with the chilli too 😀 And I think we eat in a similar way except we tend to drink only when we go out.